Mehandi – An Ancient Folk Art "Mehandi is one of the most ancient folk art in the history of Rajasthan. Mehandi or Henna is considered to be very aspicious and is applied at the time of special occasions like marriage, festivals, engagements and karva chauth, which symbolize life and prosperity. " Decorate your hands and feet with the impression of Mehandi and bring the good fortune in your life, that lasts forever. 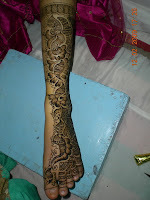 Mehandi is also known as henna, which is a temporary art of skin decoration. In Rajasthan, Mehandi is a very ancient folk art, which signifies life and prosperity at the time of various special occasions. It is one of the most precious jewel for brides, to carry good luck for their married life. According to Indian customs and traditions, the grooms are also adorned with beautiful designs which are as elaborate as those of brides. Whereas, the practice of decorating body with the hues of Henna, dates back to ancient era. It is believed that henna was first discovered in Egypt for coloring fingertips, nails, palms, hands and the soles of the feet. In Middle East, the leaves of the henna plant have been used for centuries for the beautification of hands and feet. It has been done particularly, at the time of various occasions and events. Procedure to Apply Mehandi !!! by the plastic cone or a paint brush. Once all the items are ready, than a fantasy of delightful patterns are created. The use of Rajasthan's Mehandi decoration ruled the fashion market of the world, from late 1990s the art of mehandi achieved great heights and was more popularly known as "Henna Tattoos". The Patterns and Designs !!! Although there are large variety of patterns, the one called chowk- literally meaning a courtyard, is amongst the most popular with the womenfolk. There are different forms of designs and patterns used at the time of various festive occasions. Thus, there is a specific design of chowk for the Gangaur - dance festival, another for the Teej, and yet another for Holi and other festivals. Amongst other favorites are chopper design, representation of a game, played by throwing dice and is symbolic of conjugal love. Pankhi or Beejani , yet another fabulous pattern, meaning a hand-fan, a typical design for the summers and not to forget the famous lahriya pattern, which literally means a wave or a ripple, it is the most popular pattern in the rainy seasons. In Rajasthan, which is a home to myriad occasions and colourful event, Mehandi has a great significance and respect quite linked to spacious occasions like Karva Chauth, Raksha Bandhan, Weddings, Teej and all other related occasions. Henna is considered to be an ancient herb of grace and healing. Once you apply on skin, it act as a valuable medicine, thus protect the body from fungi and bacteria. It has the capability to lower the body temperatures, headaches, fever, burning feet, and violent temper. For More Darker Designs !!! Mix a henna paste beforehand, once the paste is ready, apply it on the chosen area and keep it warm by exposing it in the natural light. After 6 to 8 hours, remove the dry mehandi by scrubbing, then apply mehandi oil, take care, do not wash your hands with water, it might have negative effect on the color. These tips will help you achieve the darker design. Famous Amongst International Tourists !!! A tourist around the globe, especially come to India just to experience its rich customs, culture and traditions. Today, Mehandi art has not escaped from the catching eyes of tourist who has developed keen interest in this myriad tradition of applying mehandi. 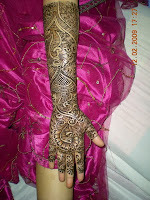 Specially the various mehandi patterns and designs and the lasting impact allure our international tourist. Come and experience the magic of natural herb of Henna that will bring good luck on your way.